> it is really convenient and helps quite a bit with instruction bandwidth. > I'd also add one thing which wasn't in original POWER/PPC which is predicated moves. > registerB is SO convenient and saves so many stupid little pipeline bubbles. the CLEANEST solution is the one where none of the mess is exposed. Flags and condition registers are nothing but mess. The compare and branch should be done together in the same intruction and the intermediate results never stored. So you don't need a second register file just for condition registers, nor special mov instructions to touch that register file, nor a special renamer for it. You also reduce the number of instructions to be executed by one per branch, and eliminate two expensive register file accesses - one to write the condition code and one to read it back. This is clean. It is also efficient, which is why x86 has been doing compare+branch fusion since Conroe. Seni (seniike.delete@this.hotmail.com) on February 14, 2013 7:45 am wrote: > Maynard Handley (name99.delete@this.redheron.com) on February 13, 2013 3:53 pm wrote: > > anon (anon.delete@this.anon.com) on February 3, 2013 10:06 pm wrote: > > > Patrick Chase (patrickjchase.delete@this.gmail.com) on February 3, 2013 7:40 pm wrote: > > > > anon (anon.delete@this.anon.com) on February 3, 2013 6:11 pm wrote: > > > > > Patrick Chase (patrickjchase.delete@this.gmail.com) on February 3, 2013 4:29 pm wrote: > > > > > > Paul A. Clayton (paaronclayton.delete@this.gmail.com) on February 2, 2013 11:10 am wrote: > > > > > > > > > > > > A clean RISC like Alpha (or--from what I have read--AArch64) would be much more friendly to fast bring-up > > > > > > > of a decent microarchitecture. (Classic ARM seems to be somewhere in the middle--not as complex as x86 but > > > > > > > not as simple as Alpha--, but even with Thumb2+classic ARM it might be closer to Alpha than to x86.) 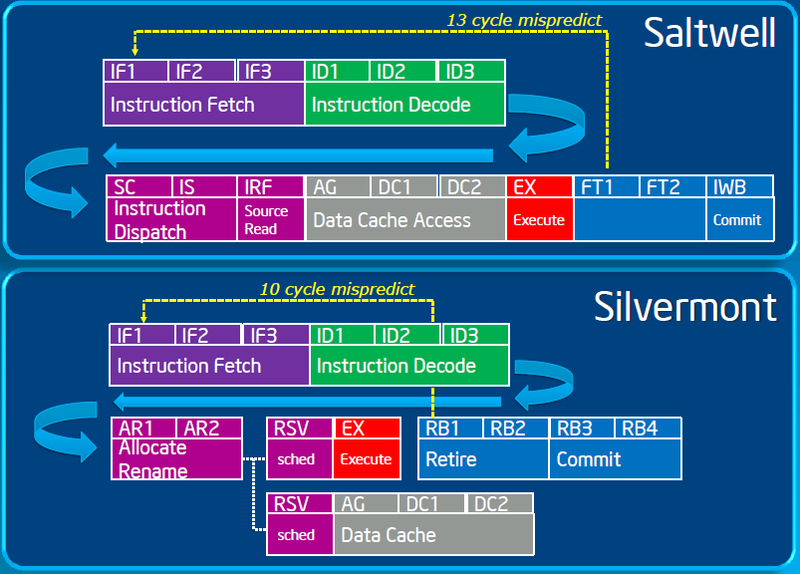 > > > > > > > > > > > > AArch64 is indeed a nice, classic RISC architecture. In particular they fixed the biggest > > > > > > single limitation of classic ARM (spending instruction encoding bits on condition-based > > > > > > predication at the expense of GPRs). I'd put it somewhere between MIPS and Alpha on > > > > > > the "architectural purity scale", and that's a pretty good place to be. > > > > > > > > > > What are some aspects of the ISA that make it less clean than Alpha, would you say? > > > > > > Thanks for the answer. > > > > > > > > > > > Continued reliance on condition flags. > > > > > > What is cleaner? GPR for comparison/branch? > > > > The right solution is what it has always been --- the PPC/POWER solution. > > (a) Multiple condition registers. > > (b) Most instructions come in two variants, one of which sets conditions, one of which does not. > > (c) Compares can choose which condition register to modify. > > > > I'd be willing to give up (b) (so that no instructions except cpmpares modify the condition > > registers) if it's considered too much hassle (eg has to be cracked into micro-ops) but > > it is really convenient and helps quite a bit with instruction bandwidth. > > > > I'd also add one thing which wasn't in original POWER/PPC which is predicated moves. > > I can live without general predication, but a predicated move from registerA to > > registerB is SO convenient and saves so many stupid little pipeline bubbles. > > the CLEANEST solution is the one where none of the mess is exposed. > Flags and condition registers are nothing but mess. > The compare and branch should be done together in the same > intruction and the intermediate results never stored. > > Like this: > > JL - Jump if Less > > JL dest, reg1, reg2 > > Jumps to displacement dest if value in reg1 is less than value in reg2 > > > So you don't need a second register file just for condition registers, nor special mov > instructions to touch that register file, nor a special renamer for it. You also reduce > the number of instructions to be executed by one per branch, and eliminate two expensive > register file accesses - one to write the condition code and one to read it back. > > This is clean. 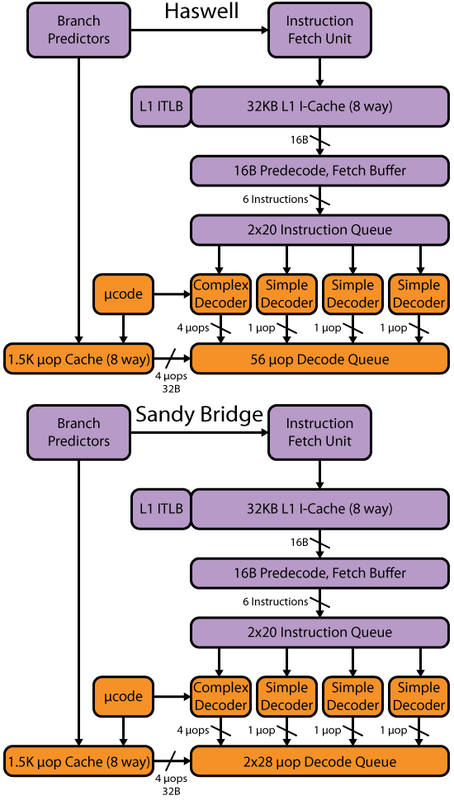 It is also efficient, which is why x86 has been doing compare+branch fusion since Conroe.